*This post is written in partnership with Mugsy Jeans. All thoughts and opinions expressed here are my own. I am continuously fascinated by the advances in tech fabrics. Nowadays, workout clothes have bamboo fibers to wick away moisture, antimicrobial silver thread to prevent odor, positively charged ions to (literally) energize your body, and mesh paneling… cuz everyone loves a mesh moment. It’s easy to see those advances in workout gear, but a lot of the tech in the fashion industry is a bit more covert. “Stretch denim” was a new concept ten years ago, but has spread like wildfire since then! People want comfort, not just style. I don’t know if you have tried on a pair of selvedge denim recently, but let me tell you, they are NOT comfortable. And I definitely don’t have the patience to wear them until they are. Leading the way in all-things-stretch is Mugsy Jeans. They’re a Chicago based brand whose roots are grounded in high-stretch denim. I’m not talking about a tiny bit of stretch to help you get them on in the morning, they’re basically like wearing sweatpants! Ridiculously comfortable and crazy stretchy. I met with Leo, the brand’s founder, a few months back. He said he started Mugsy to solve problem in the market (as many designers do): slim-cut jeans often aren’t comfortable, but straight-leg jeans aren’t flattering. Leo based his denim fit block on a hockey player, which I find fascinating. Athletic guys often have a hard time finding slim pants that fit because of their larger/more muscular thighs or calf muscles. 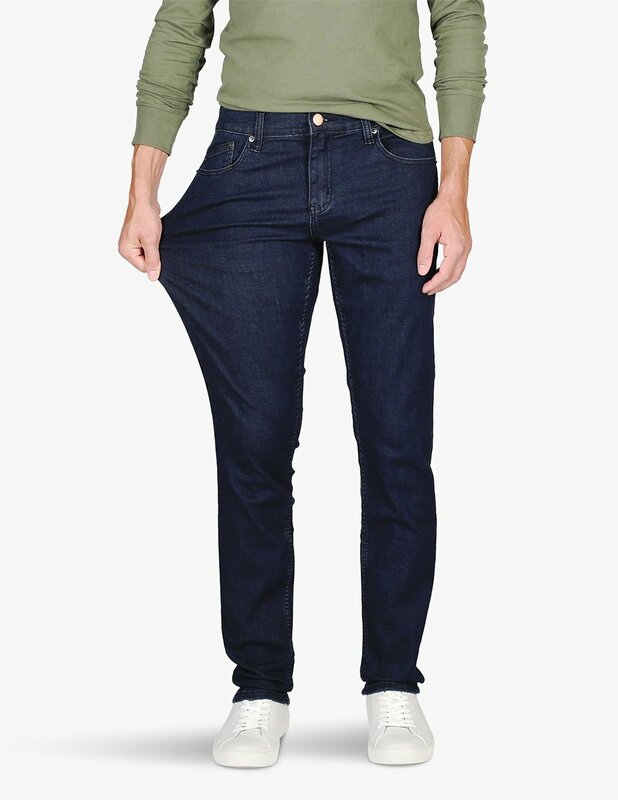 They’re usually pigeonholed into baggy jeans, but with Mugsy’s stretch material, they can have a slim leg and ease of motion. Mugsy’s collection has since branched out into chinos and shorts, and I grabbed a pair of their Olives to kick off the Fall comfortably. If you’re looking for ridiculously comfortable jeans or chinos and you have that same fit issue a lot of guys have, check out the full line up here!